Monday’s the day we find out if our Facebook profile information was taken as part of the Cambridge Analytica breach — but Facebook won’t be telling us which of our friends, if any, is to blame. The embattled social media giant announced last week that on April 9, users would be informed if their data was harvested by the U.K.-based data analytics firm without their knowledge or consent, and generally how it might have gotten into their hands. The notifications will start to go up at noon EST. After initially saying 50 million users’ info was stolen, Facebook last week revised the number to up to 87 million people — mostly in the U.S. — who could have had their data “improperly shared” with Cambridge Analytica. Cambridge Analytica collected these profiles without users' consent via third-party apps, and used that data to target content in ways designed to help Donald Trump’s campaign. Cambridge Analytica works on “psychographic” profiling, meaning they use data they’ve collected online, often through Facebook, to create personality profiles for voters. That makes it easier for political campaigns to target specific individuals. In 2016, the Trump campaign hired the company to run its digital operations, but the company maintains the data was never used to meddle with the 2016 U.S. election. 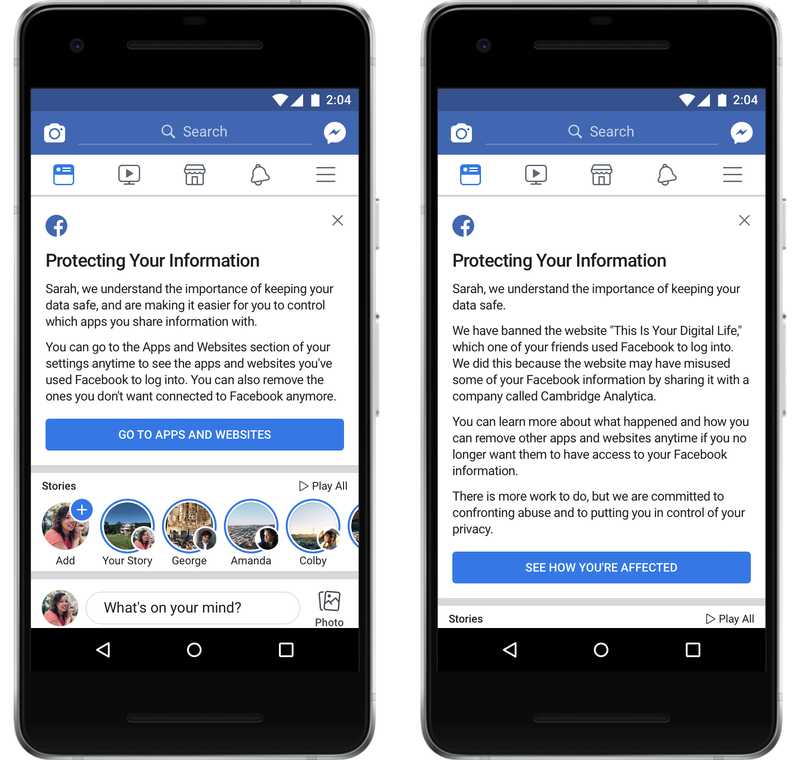 When users go to Facebook Monday, they’ll see a “protecting your information” link at the top of their news feed, with a detailed message explaining if their information was stolen or not. If a user was affected by the data breach, they’ll see a message detailing which website or app took their information. Users can use that link to go to a section of Facebook where they can see each app and site they’ve used Facebook to log in to, and remove any they no longer want connected to their account. Users could have had their data stolen by taking a certain quiz — or if their friends took a quiz, or if friends of their friends took a quiz — that required them to log in to Facebook. If their data was taken because of a move made by one of their Facebook friends made, the user won’t be able to tell which friend is to blame. Facebook has been under fire for several privacy breaches in the past year, including Russia meddling, its handling of “fake news,” public profiles being deleted, spreading hate speech, and more. And the scrutiny has only intensified since the Cambridge Analytica news broke about a month ago, with its stock price dropping and CEO Mark Zuckerberg getting called to testify in front of Congress this week, He’s expected to answer questions on how he plans to run his company more responsibly and protect user information. On Tuesday, he’ll be questioned by the Senate Judiciary and Commerce committee, and on Wednesday he is set to be questioned by members of the House Energy and Commerce Committee.